Instantaneous reserve is generating capacity, or interruptible load, available to operate automatically in the event of a sudden failure of a large generating plant or the HVDC link. This service is required to stop the resulting fall in frequency and allow the system frequency to recover promptly to 50 Hz. We enter into instantaneous reserve contracts with participants who can offer instantaneous reserve compliant with our technical requirements and the Code. Instantaneous reserve is procured on a half-hour clearing market basis. Instantaneous reserve costs are paid by asset owners of generating units greater than 60 MW and the HVDC owner (Transpower). Costs are allocated on an island basis, proportional to the quantity of electricity injected by a generator or the HVDC transfer quantity (see clause 8.59 in the Code for details). 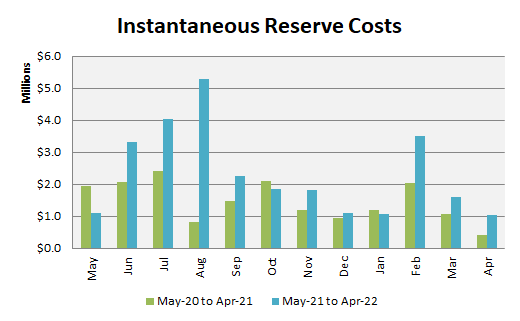 For the year to 31 March 2018, the costs for procuring instantaneous reserve were approximately $17 million. We use a computer program called the Reserve Management Tool (RMT) to calculate the amount of instantaneous reserve to be procured for each trading period. To find out more about RMT see the Reserve Management Concepts Animation link at the bottom of this page.